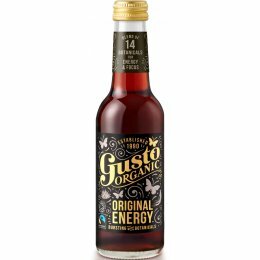 Gusto launched in 1990 and were the first company to produce organic certified energy drinks in the UK, both Gusto Original and Gusto Lemon Energy blend organic guarana, ginseng and botanicals to create uplifting beverages that deliver taste, stimulation and wellbeing. The Gusto energy range are sweetened with organic fruit juice and agave, never sugar. The Gusto team launched their first soft drink - Gusto Cola in 2016 - the first natural low calorie cola in Europe, free from artificial sweeteners, preservatives and phosphoric acid - a delicious, Fairtrade 50 calorie treat.